It has been a year in the life of the Quinn family. Another December in Nantucket is here. So what's new with the characters? Kelley's missing Mitzi. He has not divorced her and when she calls to beg to attend the baptism of Kevin's new daughter, Genevieve, he can't say no to her. It seems things between Mitzi and George, the yearly Santa Claus, are not going well. George might even start dating someone else! Margaret is still dating the pediatric surgeon, Drake. She's very happy with him. She's also quite involved with the Inn and with her children lives too. Kevin and Isabelle are preparing for the baptism when Kevin's ex-wife Nora makes her presence known. She's back to create trouble for the Quinn's family. Ava is dating Scott and she couldn't be happier. Then, Scott invites another teacher to the Winter Stroll and when she gets hurt, Scott feels responsible and takes care of her, leaving Ava behind. This leaves room for Nathaniel to make a pass at her. Nathaniel is back on the island with the sole purpose of recovering Ava as his girlfriend. Bart is still missing in Afghanistan but all his family is thinking of him. Jennifer, Patrick's wife has become addicted to pain meds and Ativan. She's trying to figure out a way to get more pills for herself. She thinks she will stop using when Patrick is out of prison. A lot has happened in the last year and many more things happened in this novel. All exciting and interesting to me since now I'm invested with these broken characters. 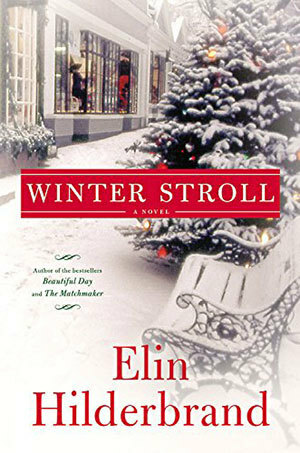 The audio was fantastic and I would love to do a Winter Stroll myself during December in Nantucket. One of the things I love the most is how they were thinking about Bart and how the light in his room was always on. I'm surprised I have come around to liking Mitzi. I was so happy with the way she felt at the end of The Winter Inn but after finishing Winter Stroll, I understand her better and I'm rooting for Kelley and her to fix things between them. Ava's love life is a mess. I'm leaning towards Scott but who knows. Kevin had a moronic moment but thanks to George, not everything was lost to him.